Dr. Hyunbum Kim joined to the Department of Computer Science at University of North Carolina at Wilmington, NC, USA in August 2014. He received Ph.D. degree in computer science from the University of Texas at Dallas, Richardson, TX, USA under the supervision Dr. Jorge A. Cobb. He received M.S. degree in computer science and engineering from Hanyang University, South Korea under the supervision of Dr. Heekuck Oh. Also, he received B.S. degree in computer science from Pyeongtaek University, South Korea. 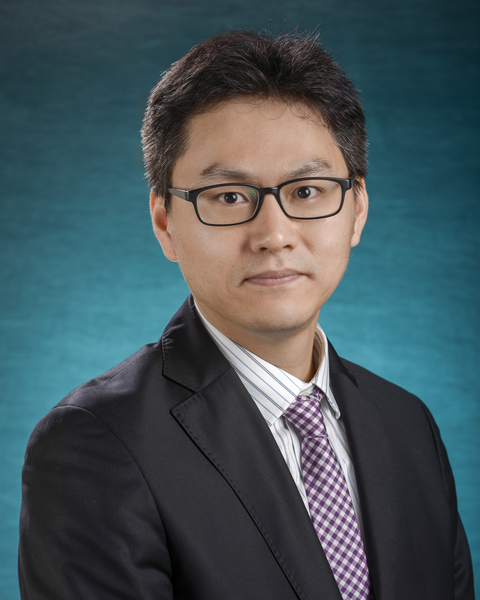 His research interests include system and algorithm design/analysis/optimizations in various areas including Internet of Things (IoT), Next Generation Systems with AI perspective, Unmanned Aerial Vehicles (UAVs), Smart Cities, Blockchain-based Systems, Cyber Physical Systems, Edge Computing, Vehicular Ad-hoc Networks (VANET), Mobile Computing, Distributed Computing, Wireless Sensor Networks, Privacy, Cyber Security. 04/2019 Invited to serve TPC member of ICOIN 2020. 04/2019 Invited to serve Co-Chair of ACOSIS 2019 - Track 3: Information Security. 04/2019 Invited to serve TPC member of IEEE GLOBECOM 2019 - Next Generation Networking and Internet Symposium. 04/2019 Invited to serve TPC member of International Conference on Pattern Recognition and Artificial Intelligence (PRAI) 2019. 04/2019 Invited to serve TPC member of IEEE SmartIoT 2019. 03/2019 A journal paper is accepted by IEEE Transactions on Sustainable Computing. 03/2019 Invited to serve TPC member of IEEE MENACOMM 2019. 03/2019 Invited to serve TPC member of IEEE GLOBECOM 2019 - Communications, Software, Services and Multimedia Appications Symposium. 03/2019 Invited to serve TPC member of IEEE ISCC Workshop PEDISWESA 2019. 03/2019 Invited to serve TPC member of IEEE CCWC 2020. 03/2019 Invited to serve Co-Chair of IEEE GLOBECOM 2020 - Ad Hoc & Sensor Networks Symposium. 03/2019 Invited to serve TPC member of IEEE GLOBECOM 2019 - Mobile and Wireless Networks Symposium. 03/2019 Invited to serve TPC member of IEEE IWCMC 2019 Workshop SeNTApE. 03/2019 Invited to serve TPC member of ICACCI 2019. 03/2019 Invited to serve TPC member of IOTAIS 2019. 02/2019 Invited to serve TPC member of ICGSP 2019. 02/2019 Invited to serve Publicity Chair of IEEE ICNC 2020. 02/2019 Invited to serve TPC member of ISAECT 2019. 02/2019 Invited to serve TPC member of ICRAE 2019. 02/2019 Invited to serve TPC member of UNet 2019. 02/2019 Invited to serve TPC member of IEEE COMNETSAT 2019. 02/2019 Invited to serve TPC member of IARIA EMERGING 2019. 01/2019 Invited to serve TPC member of IARIA MOBILITY 2019. 01/2019 Invited to serve TPC member of IARIA ACCSE 2019. 01/2019 Invited to serve TPC member of IEEE INFOCOM 2019 Workshop IECCO. 01/2019 Invited to serve TPC Co-Chair of IEEE WINCOM 2019. 01/2019 Invited to serve TPC member of IEEE 5G World Forum (WF-5G) 2019. 01/2019 One of recipients of the 2019 Cahill Grant Award at UNCW. 12/2018 Invited to serve TPC member of IEEE ICSigSys 2019. 12/2018 Invited to serve TPC member of IARIA INNOV 2019. 10/2018 Invited to serve TPC member of IEEE ICCCN 2019. 10/2018 Invited to serve TPC member of IEEE UIC 2019. 10/2018 Invited to serve TPC member of ICEECE 2019. 09/2018 Invited to serve Track Co-Chair of IEEE VTC 2019 Spring - Track 6: Green Communications and Networks. 09/2018 A conference paper is accepted by IEEE CCNC 2019. 09/2018 A conference paper is accepted by IEEE UEMCON 2018. 09/2018 Invited to serve TPC member of IEEE ICC 2019 (Ad Hoc and Sensor Networks Symposium). 08/2018 Invited to serve TPC member of ICOIN 2019. 08/2018 Appointed as Editorial Board Member of IET Wireless Sensor Systems. 08/2018 Invited to serve TPC member of AGERS 2018. 08/2018 Invited to serve TPC member of IEEE ICC 2019 (Communications, Software, Services and Multimedia Appications Symposium). 08/2018 Invited to serve TPC member of IEEE WCNC 2019. 08/2018 Invited to serve TPC member of IEEE CCNC 2019. 08/2018 Invited to serve TPC member of IEEE ICEED 2018. 07/2018 Invited to serve TPC member of ICACCP 2019. 05/2018 Invited to serve TPC member of SIGTELCOM 2019. 05/2018 Invited to serve TPC member of ICCEREC 2018. 05/2018 Invited to serve TPC member of ICTC 2018. 05/2018 Invited to serve TPC member of IEEE WCSP 2018. 04/2018 Invited to serve TPC member of IEEE GPECOM 2019. 03/2018 Invited to serve TPC member of IEEE SmartIoT 2018. 03/2018 Invited to serve TPC member of IARIA INNOV 2018. 03/2018 Appointed as General Chair of IEEE ISCC Workshop PEDISWESA 2018. 03/2018 Invited to serve TPC member of IEEE COMNETSAT 2018. 03/2018 Invited to serve TPC member of IEEE IOTAIS 2018. 02/2018 A journal paper is accepted by Mobile Information Systems. 02/2018 Invited to serve TPC member of IEEE GLOBECOM 2018 - Mobile and Wireless Networks Symposium. 02/2018 Invited to serve TPC member of IEEE GLOBECOM 2018 - Communications, Software, Services and Multimedia Appications Symposium. 02/2018 Invited to serve TPC member of International Conference on Pattern Recognition and Artificial Intelligence (PRAI) 2018. 02/2018 Invited to serve TPC member of IEEE ICSigSys 2018. 01/2018 Best Paper Award - A conference paper is selected as one of Best Papers in IEEE UEMCON 2017. 01/2018 Invited to serve TPC member of IARIA EMERGING 2018. 01/2018 Invited to serve TPC member of IEEE ICC 2018 Workshop UAV-5G. 01/2018 Invited to serve TPC member of ICOCOE 2018. 01/2018 A conference paper is accepted by IEEE ICC 2018. 12/2017 Appointed as Associate Editor of Springer Human-centric Computing and Information Sciences (SCIE). 12/2017 Invited to serve TPC member of IEEE ICC 2018 Workshop ICECC. 12/2017 Invited to serve TPC member of IARIA ACCSE 2018. 12/2017 Invited to serve TPC member of IARIA MOBILITY 2018. 12/2017 Invited to serve TPC member of ICACCI 2018. 12/2017 Invited to serve TPC member of IEEE UIC 2018. 12/2017 Invited to serve TPC member of IEEE INFOCOM 2018 Workshop IECCO. 12/2017 Invited to serve Publicity Chair of IEEE IWCMC 2018 - Wireless Networking Symposium. 11/2017 Appointed as Journal Editorial Board Member of Wiley Internet Technology Letters. 11/2017 Invited to serve TPC Co-Chair of IEEE CAMAD 2018. 11/2017 Invited to serve TPC member of WOMRAC 2018. 11/2017 Invited to serve TPC member of ICRAE 2017. 10/2017 Invited to serve TPC member of UNet 2018. 10/2017 UNCW 2017 Pilot Grant Award. 09/2017 Invited to serve TPC member of I4CT 2018. 09/2017 Invited to serve TPC member of SISTECH 2018. 09/2017 Invited to serve TPC member of AVAREIT 2018. 09/2017 Invited to serve TPC member of RESEECS 2017. 09/2017 Invited to serve TPC member of ARiEET 2017. 09/2017 Invited to serve TPC member of IEEE SCOReD 2017. 08/2017 A conference paper is accepted by IEEE UEMCON 2017. 08/2017 Invited to serve TPC member of IEEE TENCON 2017. 08/2017 Invited to serve TPC member of IEEE ICOIN 2018. 07/2017 Invited to serve TPC member of IEEE 5G World Forum (WF-5G) 2018. 07/2017 Invited to serve TPC member of IEEE VTC 2018-Spring. 06/2017 Invited to serve TPC member of IEEE WPMC 2017. 06/2017 Invited to serve TPC member of IEEE ICC 2018 (Communications, Software, Services and Multimedia Appications Symposium). 05/2017 A journal paper is accepted by Elsevier Journal of Computational Science (Impact Factor: 1.078). 05/2017 Invited to serve TPC member of IEEE ICC 2018 (Ad-Hoc and Sensor Networking Symposium). 05/2017 Invited to serve TPC member of IARIA EMERGING 2017. 04/2017 Invited to serve Co-Chair of IEEE GLOBECOM 2018 - Wireless Communications Symposium. 04/2017 A journal paper is accepted by IEEE Communications Letters (Impact Factor: 1.291). 03/2017 Appointed as Guest Editor for Special Issue of Concurrency and Computation: Practice and Experience (CCPE), 2017. 02/2017 Invited to serve TPC member of IEEE GLOBECOM 2017. 01/2017 A conference paper is accepted by IEEE ICC 2017. 01/2017 Invited to serve TPC member of IEEE International Conference on Ubiquitous Intelligence and Computing (UIC) 2017. 01/2017 A journal paper is accepted by Elsevier Journal of Network and Computer Applications (Impact Factor: 2.331). 01/2017 Invited to serve TPC member of International Workshop on Smart Sensor Networks & Applications (WSSNA) 2017. 12/2016 Invited to serve TPC member of IEEE INFOCOM 2017 Workshop IECCO. 12/2016 Appointed as Journal Editorial Board Member of MDPI Computers. 11/2016 Invited to serve TPC Co-Chair of IEEE WINCOM 2017. 11/2016 A journal paper is accepted by Wiley Concurrency and Computation: Practice and Experience (Impact Factor: 0.942). 11/2016 Invited to serve Co-Chair of IEEE ISCC Workshop PEDISWESA 2017. 11/2016 Invited to serve TPC member of IEEE UNet 2017. 10/2016 Invited to serve Publicity Chair of IEEE IWCMC 2017 - Wireless Networking Symposium. 10/2016 Invited to serve TPC member of MobiSPC 2017. 08/2016 Invited to serve Session Chair of IEEE GLOBECOM 2016. 07/2016 A conference paper is accepted by IEEE GLOBECOM 2016. 06/2016 Invited to serve TPC member of IEEE ICC 2017. 06/2016 Invited to serve TPC member of IEEE WINCOM 2016. 05/2016 Invited to serve Session Chair of IEEE DCOSS 2016. 02/2016 One of recipients of the 2016 Summer Research Initiative Award at UNCW. 02/2016 Invited to serve TPC member of IEEE GLOBECOM 2016. 02/2016 A conference paper is accepted by IEEE International Conference on Communications (ICC) 2016. 01/2016 Invited to serve Publicity Chair of IEEE WINCOM 2016. 12/2015 Invited to serve Session Chair of IEEE ICNC 2016. 11/2015 Invited to serve Publicity Chair of IEEE IWCMC 2016 - Wireless Networking Symposium. 09/2015 A conference paper is accepted by IEEE International Conference on Computing, Networking and Communications (ICNC) 2016. 09/2015 A journal paper is accepted by Elsevier Computer Networks (Impact Factor: 1.256). 09/2015 Invited to serve TPC member of IEEE ICC 2016. 08/2015 A journal paper is accepted by Elsevier Ad Hoc Networks (Impact Factor: 1.530). Journal Reviewer of IEEE Computer Special Issue (May, 2015): "The Web: The Next 25 Years"